Watch Monday, January 5, 2015 at 7pm on WORLD. The story of a year's time at Dignity Harbor; one of three homeless encampments along the Mississippi River in the downtown area of St. Louis, north of the Arch. They must survive living in the cold of the harsh winter, but as temperatures drop and tempers rise, the camp members are challenged with living together. All of this while the city looms over, waiting for a chance to move them out. 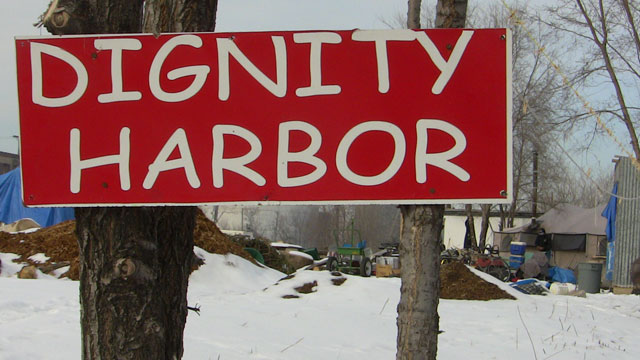 Dignity Harbor introduces us to 'OG', the three-year leader of Dignity Harbor, who builds wooden huts to replace old tents as winter slowly begins to creep in. He and the other men of the camp have sworn to protect and harbor any abused women. They work hard to split and sell donated firewood to keep that goal alive, along with themselves. As winter comes and goes, Dignity Harbor faces challenges, not only by Mother Nature's hands, but by their own. A camp member brutally mugs one of its own while another two fight over sexual orientation, all mixed with paranoia and drugs, leaving the camp at the brink of collapse. With the city threatening to kick the encampments off the land after fires, violence and a murder, will Dignity Harbor last another year?